ON 31 MARCH 2016, India marked six years of the coming into force of the Right to Education. And those closely monitoring its progress and journey were yet again disappointed and agitated over no palpable improvements in reducing the existing gaps in the implementation process of the Right to Education Act that came into force on April 1, 2010 nationally except Jammu & Kashmir. As per the latest ‘Status of Implementation of the RTE Act, 2009’ report of the Delhi-based RTE Forum which claims a membership of over 10,000 activist members, groups and organizations spread over 20 states, only 9.05% of India’s 1.45 million schools were reported RTE compliant by DISE during 2014-15. The report was released at the 6th annual National Stocktaking Convention of the activist- coalition on March 21 in New Delhi. Activists fear mass closure of government schools owing to patchy implementation of the RTE Act besides an ‘orchestrated’ privatization of school education design using methods like PPP (public private partnership) and international NGOs participation. The absence of RTE mention in the New Education Policy themes currently under consultation process is also being pointed out as deliberate ploy to undermine state role in school education. Also, there is a realization among experts that the big mistake in the whole Act has been the missing ‘Financial Memorandum’. In view of experts, had it been there, the RTE story would have been all the way positive. Vice-President Hamid Ansari, who inaugurated the day-long convention called for a need for having special audit mechanisms like in the case of MNREGA for effective implementation of the ‘remarkable’ Act. According to left leaning economist Prof Jayati Ghosh of JNU, education is not a priority for this government and there has been a cut of 25% central allocation to school education. “As a society we’ll be losing big time if we allow closure of public schools. And this should be a national issue.” Another noted educationist, Prof Anita Rampal of Delhi University feels that in the market age, people are neglecting the social objectives education, which is to end biases, prejudices, and of fostering egalitarianism among children. “An evaluation of education process should be this change and not necessarily minimal learning, etc. Otherwise we may end up creating more walls in the name of good education” she says. It becomes logical here to mention that ‘State of the Nation: RTE Section 12(1)(c) report’ compiled and published by a collaborative alliance of civil society groups—The RTE Resource Centre at IIM Ahmedabad, Central Square Foundation (CSF), Accountability Initiative (Centre for Policy Research) and Vidhi Centre for Legal Policy—all based in Delhi, says that only 346108 out of an estimated 2289676 seats (all India)were filled up in 2014-15 academic session, which in terms of percentage translates to just 15.2% of the available seats under Section 12(1)(c) of the Act. The same report also highlights that only 21% of the eligible schools admitted children under this section. Section 12(1)(c) which has been a subject of numerous litigations since RTE Act enactment and finally held valid by the Supreme Court, mandates that private unaided schools keep aside 25% of their entry level seats for children belonging to economically weaker sections and disadvantaged categories. The patchy implementation of this section of the Act, in particular states like UP and Andhra where the fill rate is zero is emerging as one of the dominating issues in the discussions around the RTE Act. While a section of the civil society groups deem the section as an affirmative action for empowering and mainstreaming tens of thousands of marginalized children with ‘good’ private education, there is another section of activists who see in it a definite design for promotion of private school education. According to some there is a concerted effort to defame government school system and research showing good practices in these schools is not published. A few instances have also come to fore where enrolments have been made in private schools just to tap government reimbursement money. Dr Niranjanaradhya of National law School University, Bangalore is of the view that the section 12(1)(c) is nothing but backdoor privatization of school education and effort is on to manufacture consent for privatization and PPP. “RTE is not implemented holistically, 90% of the funding for SSA comes from education cess, is this the way to implemented RTE Act?” he asks. Economist Praveen Jha of JNU while explaining progressive decrease in the state spending on education says that some dishonest intellectuals like Prof Geeta Kingdon were resorting to cheap tricks (research) to show superiority of private education as education is seen as a big market. Consequently a wrong impression is made on public mind to see government schools as inferior. Running government schools is becoming a big issue. According to Prof Govinda, we have forgotten about the RTE after making it a fundamental right. “The voice of children feeble as it is, is getting suppressed by talks of brining back no detention. The thinking in governments is padhai nahi, fail karo (don’t educate, but fail). We have to optimize resources and see if 200 days of teaching/learning has happened in every school,” he adds. Why the buck of poor performance must stop with the teacher, is another debate getting bigger in RTE discussions. “Parents and children have more faith in education system than the system has in itself. For that trust, the entire system from bottom to top must be held accountable and only then there will be qualitative improvement,” says Prof Shantha Sinha. Prof Srikant of NCERT is of the view that there is a basic flaw in understanding role of education in the life of a child. “School education plays larger role in personality development of the child, so the processes need to be fixed in government schools instead of focusing on norms like distance etc. Private schools have a selective admission criterion and therefore can control their performance but again not all private schools make the grade. We need to understand whether progress is taking place on expected lines,” he says. Priyank Knoongo, member NCPCR feels that there is a dearth of research in curriculum and implementation strategy and needs special training programs. “Child-centric laws, conventions and polices should be included in teacher education so that their understanding of child issues, rights and law helps in implementation strategy,” he said while advocating reduction in non-teaching time of teachers as a priority. So, while RTE Act and its implementation remains a promise to fulfill, the nation must see its nationalism in improving schooling experience of children. Schools are the building blocks of nation building. These are sacred places where children first sing national anthem, salute national flag, and imbibe patriotic values. If India has to take pride in being one of the oldest civilizations, spring board of knowledge and wisdom, and global leader in emerging knowledge economy then, it has get its act together and invest liberally into education. In words of Prof J B Tilak, Vice-chancellor NUEPA, quality education may be very expensive but investing liberally into has a good return on investment, not doing so is fraught with disastrous costs . Reverse migration to government schools must be the mission. 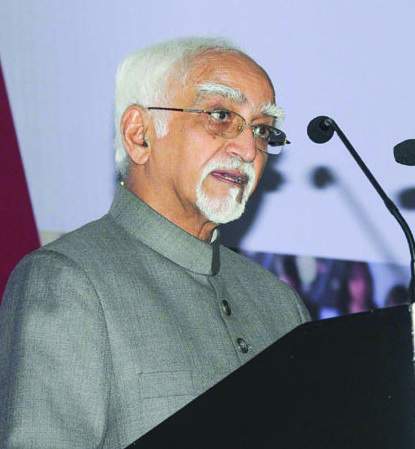 In his special address, Vice President Hamid Ansari said that it is said that quantity, quality and equality are the three sides of the triangle required to ensure Right to Education. Here is an abridged version of his landmark speech..
n the last six years, the Right to Education Act has shown promising developments. The government’s budget for the Sarva Shiksha Abhiyan, the main vehicle for the Act’s implementation, has increased substantially from Rs. 12,825 crores in 2009-10 to Rs 22,500 crore in 2016-17. Some 3.5 lakh schools have been opened in the last decade and 99% of India’s rural population now has a primary school within a one kilometre radius. A survey in 2014 reported that 84.4% schools now served the mid-day meals, 48.2% schools had proper and functioning toilets for girls and 73% schools had available drinking water. The enrolment of girls has increased slightly from 48.12% in 2009-10 to 48.19% in 2014-15 at the elementary level. For boys, the enrollment at primary level is now 52%. A 55% decline in dropouts was also reported in the age group 6–14 years, from 13.46 million in 2005 to 6.06 million in 2014, with the annual average primary school dropout rate declining from 6.8% in 2009-10 to 4.3% in 2013-14. These are significant gains. Yet a critical appraisal of the functioning of the Right to Education reveals that large gaps exist in its implementation. Even with the increasing primary enrolment rates, India has the largest number of out-of-school children in the world which is more than the out of school children in whole of sub-Saharan Africa. There is a huge disparity between the urban and rural education and rich and poor children have radically different schooling experiences. One of the most stringent criticisms of the RTE has been the quality of education being provided. The Global Monitoring Report 2012 ranked India a low 102 out of the 120 countries on the Education for All (EFA) Development Index, based on progress in universal primary education, adult literacy, gender parity and the quality of education. About Rs 1,15,625 crore ($17.7 billion) has been spent on Sarva Shiksha Abhiyan (SSA)—the national programme for universal elementary education and a core element for implementing the RTE—over the last five years, so the decline in the quality of learning is particularly disturbing. Low learning and falling quality of education imparted to children has grave implications for the future of our society and the country. This should be a cause for serious concern to the government. The quality of education suffers due to understaffing and lack of training of teachers. The flow of public funds has so far been focused on developing school infrastructure. Teacher training has been a neglected area. An Oxfam India policy report in March 2015 indicated that over 5 lakh sanctioned teacher’s post were lying vacant and more than 6.6 lakh in-service teachers were un-trained. Around 37% of primary schools were found to be non-conformant with the prescribed national pupil – teacher ratio (PTR) norm of 30:1. Moreover, around 10% of schools across the country remained single teacher schools. Teacher absenteeism, which is rampant in several parts of the country, particularly impacts the disadvantaged students. The UNESCO EFA Monitoring Report for 2014, noted that teacher absenteeism in India varied from 15% in Maharashtra to 42% in Jharkhand. We need many more good teachers- and the only way to do that is to make the remuneration more attractive, recruit better teachers, provide them with better training and monitor their performance and availability closely. Answering a question in the Rajya Sabha, on 10th March 2016, the Minister for HRD said that in 2014, some 6.064 million children remained out of school. There has been an expansion in the number of schools but the Right to Education Forum Stocktaking Report for 2014, suggests that across the country, less than 10% schools comply with all the RTE norms. State and National Child Rights Commissions have been working actively with governments to reduce the percentage of children out of school. Despite such efforts, we continue to see children working at roadside restaurants, in people’s homes, at construction sites, in shops and on the roads. However, to pick these children up and put them in school is hardly as easy as it sounds. To begin with, rescue of child laborers and punishing the employer is the work of the Labour Ministry and the state police. The responsibility of bringing children to schools and providing them quality education is the work of the Education Departments. Then again, monitoring implementation of the RTE Act is the responsibility of the child rights commissions in each state, which are under the Women and Child Development Department. Coordination between various implementing agencies has to be improved to develop synergies and create an environment conducive to promoting Right to education rules. The third issue relates to the absence of equity in education. Of the 6.064 million out of school children, a whooping 4.6 million or 76%, belonged to the Scheduled Castes, Scheduled Tribes and other religious minorities. Issues, such as those related to the 25% reservation of seats for children from disadvantaged backgrounds in private schools; poor educational infrastructure in rural areas compared to urban centers; cases of discrimination on the basis of caste; and neglect of targeted elementary education schemes for the Scheduled Castes and Scheduled Tribes and other backward communities are serious in nature. Inclusive education is inherent in Right to Education and the government must address these issues expeditiously. It is said that quantity, quality and equality are the three sides of the triangle required to ensure Right to Education. Without any one of these arms, the triangle will collapse. In this backdrop, the decline in State funding in the key social sector programmes, including education, is of particular concern. Public services like education are the key to nurture participatory growth. Financing for Right to Education remains inadequate. Total public expenditure for education, at less than 3.5% of GDP, is well below the 6% commitment made in the National Education Policies. At 52%, the Sarva Shiksha Abhiyan (SSA) received more than half the money under school- education allocation in the latest budget, but over the last five years, the Sarva Shiksha Abhiyan budget has declined by 6%, from Rs. 23,873 crore ($4.4 billion) in 2012-13 to Rs 22,500 crore ($3.3 billion) for 2016-17. While school education is primarily the responsibility of states, the central government directly finances 60% of education, through programmes such as the Sarva Shiksha Abhiyan. As many as 66% of India’s primary school students attend government schools or government-aided schools. Poor off-take from the schemes is another area of concern. Of the money set aside for the Sarva Shiksha Abhiyan during 2015-16, only 57% was released till September 2015, according to an Accountability Initiative report. In addition to increasing the government investments in education, it is also essential to maintain the funding levels of other social welfare schemes, especially those operating in the rural sector- to ensure that that falling incomes of parents do not impact the educational prospects of in-school children. Legislation is one aspect of the matter. The experience gained in operating the RTE for the past 6 years should inform the correctives to reduce the gaps and overcome the shortcomings. Although state education departments and local education authorities are responsible for monitoring the implementation of the Act, this responsibility needs to be taken more seriously. There is a need for having special audit mechanisms like in the case of MNREGA. · Vibrant partnerships among the departments and organizations concerned with children of the Scheduled Castes, the Scheduled Tribes and educationally backward minorities. Government will have to set up systems for equal opportunity for children with special needs. · Acceleration of poverty reduction programmes of the Rural Development and Panchayati Raj Departments so that children are freed from domestic chores and wage earning responsibilities. · Ensuring that State Governments get the Panchayati Raj institutions appropriately involved so that ‘local authorities’ can discharge their functions under the Right to Education Act. There is a need for close cooperation amongst departments concerned to ensure that so far the deprived children get their rights to education. The transition towards a comprehensive implementation of Right to Education will come through making parents, particularly in rural areas, aware of the benefits of education for their children. This requires a change of mindset at the community level, and accountability of all entrusted with this responsibility. Despite the shortcomings in its implementation, the Right to Education Act remains a remarkable achievement. While concerns regarding privatization of education remain, the Act offers a first step towards an educational system in India that provides access, equity and inclusion for all children.